Have you considered DEIMOS-1 as a replacement for the failing Landsat 7 mission? If not, it is worth giving it a look; and if so, give it a second one! It offers better multispectral resolution at 22-meters. 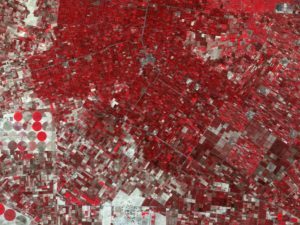 DEIMOS-1 can be tasked to time new collections of imagery with field research. The archive is robust with a low minimum order price. There are no scan line failures. The price for DEIMOS-1 is well below $1 per square kilometer. L0R – this is product has been radiometrically corrected but has not been geometrically corrected; it is meant for user who wish to orthorectify DEIMOS-1 data on their own. L1T – this product has been manually orthorectified (10-meter RMS) to a base layer Landsat ETM+ reference image; this is the default processing level. All gain and bias coefficients needed to convert raw digital numbers to radiance are included in associated metadata files. All data products are delivered as GeoTIFFs. A TFW file is also delivered with geometrically corrected products. Metadata information can be found in the .dim file. Much of this information is also summarized in the .htm file which is easier to read using a web browser. For additional information and samples images of DEIMOS-1, please refer to our website or send us an email at sales@apollomapping.com. This entry was posted in The Geospatial Times and tagged Deimos-1, monthly spotlight, The Geospatial Times by Apollo Mapping. Bookmark the permalink.